I love Indian food, but as my husband doesn’t much care for it, I don’t get to eat it too often. Fortunately for me, the non-fiction book club of which I am a member chose India Palace as the venue for our discussion of Behind the Beautiful Forevers: Life, Death and Hope in a Mumbai Undercity. Since I reviewed the book last month I won’t duplicate my reflections here, but I do want to share a short review on the restaurant. The menu is both extensive and impressive. You will find a dozen different kinds of Indian breads, Tandoori specialties from North India, nearly 20 vegetarian options, chicken, lamb and goat options. There’s also South Indian specialties such as sambar, dosa and uthappam that are not commonly found on the menus of your standard Indian restaurant. All menu items are served a la carte with main dishes ranging from $12.95 to $19.95. Extras such as naan bread, plain basmati rice, raita and chutney may be added for under $5 each. What I was most impressed about is that the restaurant can cater to both Halaal and Jain diets as well, and I don’t think I’ve ever seen Jain options on a restaurant in the United States before. Next time, I’ll have to inquire what that menu entails. As a starter, we were served roti flatbread with 3 different chutneys. The green was mild, the red spicy and the brown sweet. 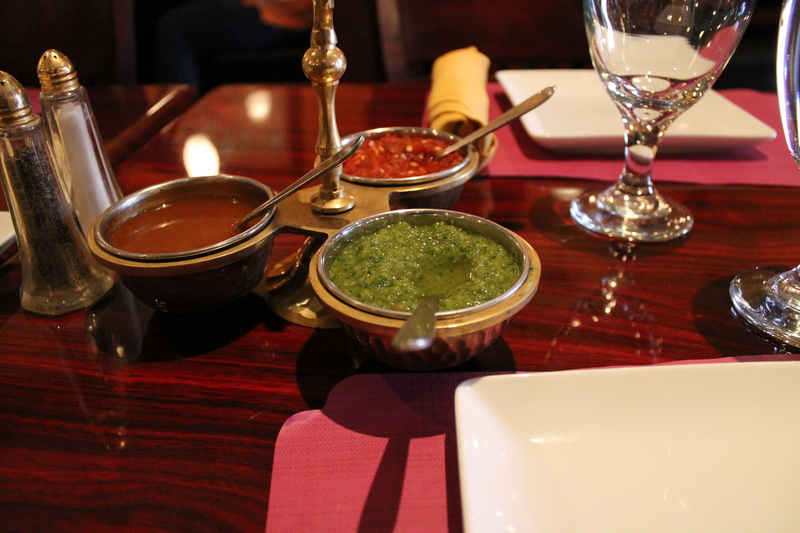 My favorite “dipping sauce” involves combining the green and red chutneys. 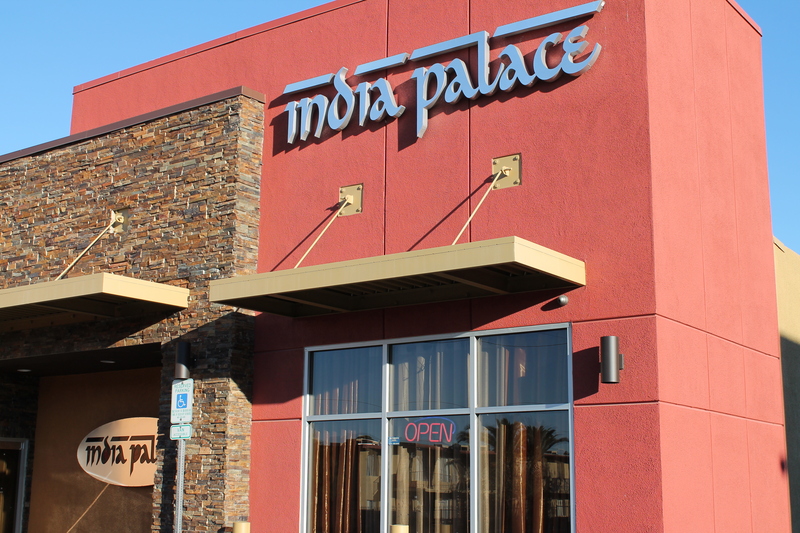 If you visit India Palace for dinner, I highly recommend the fixed price dinner specials, as they are a good value and you get to sample a range of dishes. The vegetarian special will run you $19.95 and the Tandoori chicken, rack of lamb and mixed curry dinners will run you $25.95. If you come here for lunch, the buffet is an excellent value at $10.99. For my dinner, I chose the vegetarian dinner special, which included dal soup, saag paneer (creamy spinach with homemade cheese), navratan korma (mixed veggies with cashews and almonds in a cream sauce), dal makhani (a lentil dish), raita (a cucumber-yogurt accompaniment), garlic naan, basmati rice and mango custard. 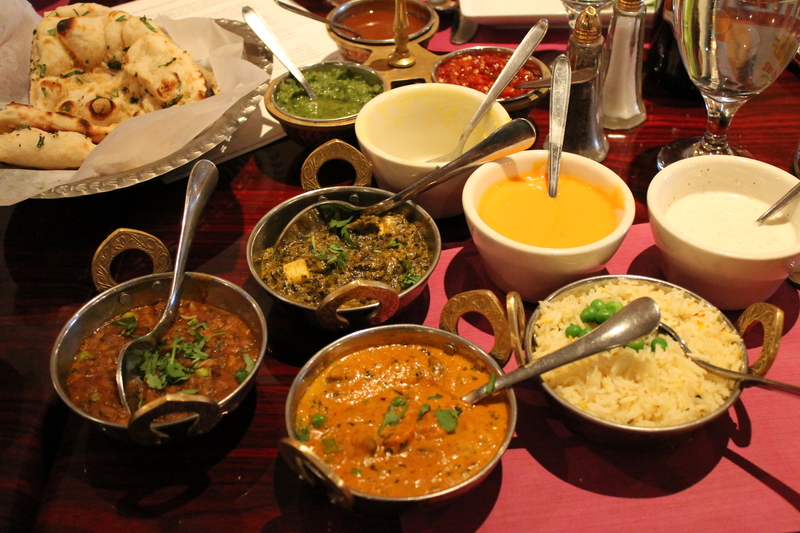 My favorite dishes were the saag paneer and mango custard. It was an abundance of food, and I definitely have enough leftovers for at least another meal. On a Monday evening in June the restaurant was half-full to two-thirds full of people the entirety of the 2.5 hours we were there. While clientele appeared to largely be people of Indian descent, there were a fair number of other tourists and locals earlier in the evening. You most likely will not need a reservation unless you are a party over 6. Also, given the location of the restaurant, it is just a short taxi ride from the Las Vegas Strip (and much cheaper than the restaurants you will find in most Strip hotels). And it is within walking distance of many hotels on Paradise Road. The restaurant also offers a selection of wine and domestic and Indian beers. A 1-liter bottle of Kingfisher lager will run you $8.95. Unfortunately their full list of beer and wine with prices is not published on their menu, and had I known the price of the Kingfisher I would have probably opted against it. This entry was posted in Las Vegas, Restaurant Reviews and tagged Indian food, Las Vegas, Las Vegas restaurant reviews, restaurant reviews. Bookmark the permalink.